Mike Paterson - Guitarist with Plastic Flies support to The Clash 7th October 1981. "..Our experience with The Clash seemed to be one that was mirrored with many other young bands wherever they played. When they had their â€œClash stand at the Glasgow Apolloâ€� in October 1981 we saw them from the audience on the first night and from the stage on the second. As a bunch of cocky kids with a tin-pot band we thought we could just rock-up to the hotel bar after the gig and get a support slot after schmoozing with Joe over a few beers. Which is exactly what happened. After managing to avoid ejection by hotel staff, myself and our chutzpah-filled singer Martin hid ourselves in the corner of the Albany Hotel bar until the Clash party arrived. They came straight to the bar and as Joe, stood next to me, ordered a round of drinks he turned to us and said â€œand what are you having?â€� Beer please, Joe. Of course nobody at the Apollo believed us. We were just four 18 year old kids with guitars standing in an alley-way. Eventually we got in, sound-checked and took our place in our room backstage. With a combination of youthful bravado and utter terror we sat waiting until we were called. Baker Glare kept coming in to use the phone (pre-mobile days). I'm sure the others in the band will add their impressions but for me the experience of playing the Apollo was like a flaming meteor; intense and over very quickly. We were standing around outside with our flight-cases and drum boxes for ages in the afternoon. None of the Bouncers believed that we were support. No one had told them and we weren't on the itinerary. Eventually The Clash turned up and their road manager let us in. We watched them rehearse beforehand from one of the boxes but were told off for coming and going backstage too much. I remember that we had a derisory sound check (traditional for third bill support I think) then came on very early (about 7.15pm I believe). My abiding memory is of confusion over turning on the Fender amp. I'd never played through one before so didn't realise that there was a standby as well as an on switch. A roadie spared me further embarrassment after a minute of catcalls and whistles from the incoming crowd by switching it on for me. We roared into action and blasted through our short set with a combination of energy and terror. I was so scared I scarcely remember a thing other than that we didn't make any mistakes or hit any bum notes. I have to say that even though we were energised with adrenaline by the experience The Clash that night were incendiary and at the peak of their powers. I appreciate now Joe Strummer's comment in The Clash documentary about how the drummer is the driving force of a band as he has to hit the nail on the head of the beat every time rather than be an improvisor like guitar and voice. Instead of barnstorming the joint they opened with a metronome dub beat from Topper that echoed through the hall and turned into a noir version of Broadway segueing into One More Time. It was a hair-on-the-back-of-the-neck moment. They were magnificent and tireless. After the gig we joined the entourage in the Clash dressing room. Theatre of Hate were depressed at the crowdâ€™s reaction to them. Pearl Harbour was drunk on vodka. Mick was buzzing and Joe was garrulous (I heard him use the â€œquintuple E.Pâ€� line several times when asked what they were doing after Sandinista). When Johnny Green announced that the band would have to go downstairs to sign autographs for fans queuing up I had the gall to say something along the lines of disapproving of fawning (maybe I thought it was the punk rock thing to say. God knows. I was 18). Joe said, â€œphoning who?â€� in mock misunderstanding then gave me a very gentle lecture on the responsibilities of their position with a poignant Sid Vicious anecdote. That was me told. A week later we had the photos that the singer's brother had taken of us from the stalls. His camera hadn't spooled on the film properly so had double exposed the images already on it. The result was that we were pictured superimposed side by side on stage with the Teardrop Explodes who had played the previous week. You'll have to ask Martin McCleish for those photos. A year later we played with The Clash again at the Magnum Centre in Irvine after having had our Apollo slot for the 1982 tour cancelled due to Joe Strummer doing a mysterious runner. Funnily enough, one of the many fans who were let into the dressing room after that gig saw us the previous year. "How come you never played 'Grovel' this time?" he asked us to our amazement..."
"..Sunday April 30th, 1970 something (7 or 8?) 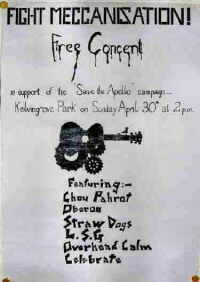 I organised a free protest concert in the amphitheatre in Kelvingrove Park called FIGHT MECCANISATION. It was in protest against the closure of the Apollo and the plan to turn it into a bingo hall and featured several local bands, including my own, LSG (Lang, Stewart and Griffin...oh dear). The others were the legendary Chou Pahrot, Celebrate, Oberon, Straw Dogs and Overhead Calm. I've still got a couple of posters for the gig which I unearthed recently. They're based on the Woodstock logo, with a mechanical bird. I was about 17 at the time and contacted the Sunday Mail, who were running an anti-closure petition. The paper sent a Limo to my house, brought me in, photographed and interviewed me, then sent me off round Glasgow in the Limo to organise security, PA and all the other stuff I needed for the gig, at their expense. Bit of a buzz for a wee hippy in an Afghan coat and love beads!!! The Mail also paid a ridiculous sum of money to Lloyds of London, the only company in the country who would take on the public liability insurance for the event. Anyway, the whole thing went well enough until our bassist showed up, very late, still partying from the night before. He approached the stage through the crowd, waving his arms and running with his trousers round his knees. On stage, in an attempt to eclipse Hendrix, he set himself on fire with developing fluid which soaked his flares as he poured it over the neck of his bass and had to be stretchered off. The Mail kind of dropped us after that, got all quiet about the event. I don't know who's still out there that'll remember the fiasco, but it DID happen, honest; the posters are here!.." "..The audiences at The Apollo were some of the wildest, loudest, most appreciative in the world! I always said that if they hated you they might kill you, and if they liked you, they might kill you anyway, by hugging your head right off your shoulders. Very demonstrative ! but, that's a Scottish audience, in general, isn't it ? No matter how our career was going at the time, playing The Apollo always made us feel special. Dr Hook were sorry to see it go...and, I certainly would have loved the opportunity to play there as a 'solo' today, but there you go. The ghost ? Only heard about it. Never experienced it. Just as well. If it was 'tough enough' to survive The Apollo, I'm sure it's still haunting someplace, somewhere in Glasgow, today! Long live The Apollo!.." "..Hello Apollomemories and what a great idea to put a website together about the Apollo. I played at the Apollo 3 times - and maybe once more with Danny Thompson (double bass player of world renown). Danny also played at the Green's Playhouse and he told me that at that time the toilet in the "Star" dressing room was actually a bucket on the floor. The venue had quite a reputation and with me being an Englishman, I was worried that the audience would eat me for breakfast. I played at the Apollo before I had had any hit records and, although I never sold out the venue, we did fantastic business. Once I remember we performed a late night show at the Apollo. It turned out that there was no time for a sound check and I was encouraged to get on because of all the noise from the crowd. I also remember one of the road crew that night being so stoned that he couldn't have changed a plug. When I perform I get pretty immersed in the music and it wasn't until the second song that I really noticed the audience. I remember someone at the front of the stalls lighting a cigarette. It was only then that I realised the height of the stage and that with the slight rake on the stage I began to feel a little dizzy. The stage was quite unique and whilst I'm sure it wasn't designed to keep the crowd away from the performers, it really did make an impression. I got a great reception from the audience in Glasgow and the audience remains one of the best. I still meet people at my shows in the town that talk about the Green's and Apollo which shows that many of them attended when they were children. Following my third show, they actually gave me a commemorative statue with a little inscription on it. I haven't won all that many other awards apart from an Ivor Novello award and I really treasured that Apollo statue for a number of years, and I'm still proud of mine. I remember when I was leaving the dressing room I met two cleaning ladies. They looked at me and said "at least you're taking yours with you." They told me that when Johnny Cash had received his statue, he hadn't treasured it so much and left it on top of the television in the dressing room. I have heard from other acts about the bouncing stage and the thunderous noise that the fans stamping their feet used to make. I have also heard that at the last show (Style Council) people were unscrewing the radiators and taking as many of the fixtures and fittings with them as they could. Anyone out there got an Apollo radiator? Was the Apollo special? Well, yes it was and the reaction to your website is more than just people and bands simply being sentimental. It was one of the few venues that had a reputation artists were aware of before they actually played there. I can only really think of a couple of London venues that had the same reputation as the Apollo, one of them being "Les Cousins" in Soho. That was no more than a front room but its reputation attracted stars like Jimi Hendrix. You just know before you go there that there is something special about it. Finally, I also heard a story from Billy Connolly that once when Morecambe and Wise played there, a member of the audience not so keen on English entertainers was heard to say "Oh no, there's two of them.".." "..I only played the Apollo once as I remember, with Wings. It was a great evening with The Campbell Town Pipe Band on hand for Mull of Kintyre. As you know the Apollo had a very high stage, 15' 6" as I recall, yet still, a very zealous fan made it up there! The show was also on the night that Scotland defeated England for the cup! And Mr. McCartney came back for encores wrapped in Scotland's flag.